Home Sleep Apnea Tests (HSAT) have increased in utilization and based on recent estimates amount to about a third of all sleep apnea tests due to their cost effectiveness and accessibility in comparison to in lab, attend Polysomnography testing. An HSAT is a preference for many patients since they can take the test at home in a more natural, relaxing and private environment that is also more likely to reflect the actual disease manifestation. Today, the vast majority payers reimburse for HSAT and some recommend it as first line diagnosis for sleep apnea. However their coding and billing requirements differ from payer to payer. It is always best to check with your payer for their specific requirements, but this article will outline some of the basics. In 2007 the American Academy of Sleep Medicine (AASM) published the “Clinical Guidelines for the Use of Unattended Portable Monitors in the Diagnosis of Obstructive Sleep Apnea in Adult Patients”2 which differentiated the HSATs by type (defined by the AASM). 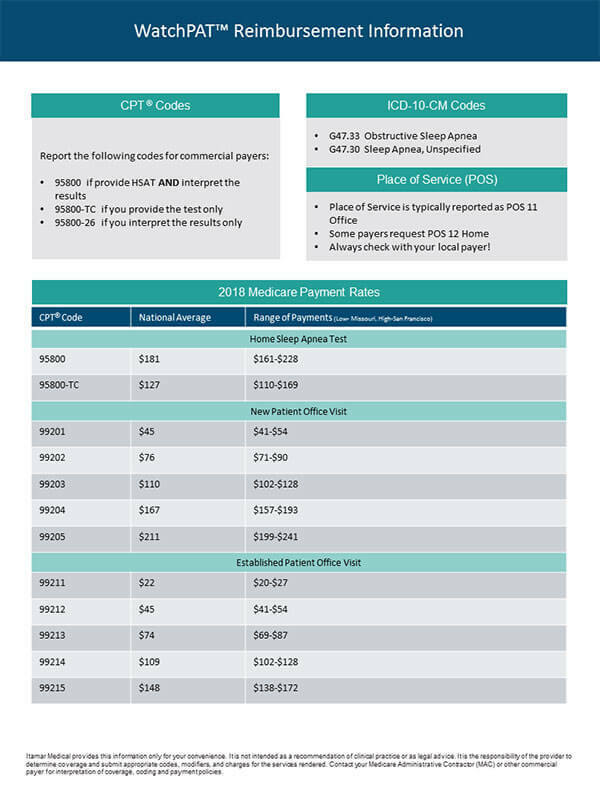 In the following year, Medicare introduced the HCPCS Level II codes G0398, G0399 and G0400 which followed the AASM types. 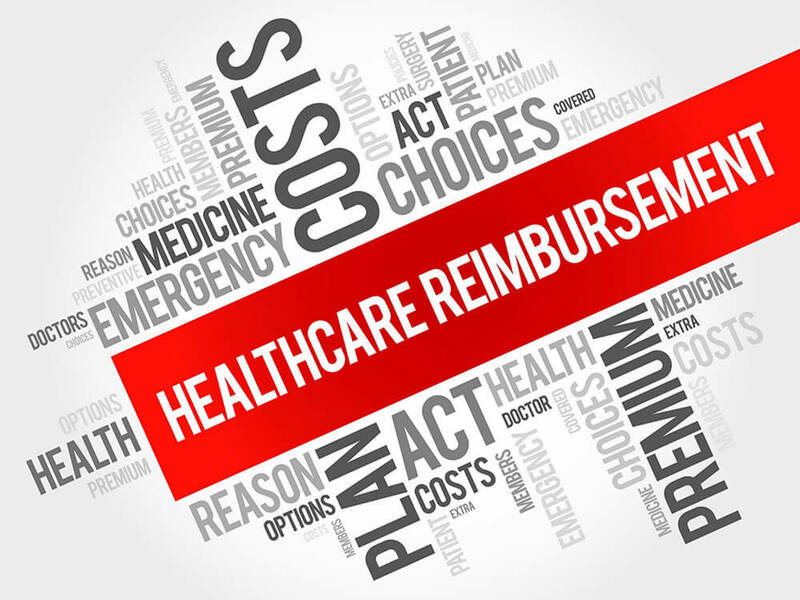 G codes are “carrier determined” which means that payment is up to the discretion of the Medicare Administrative Contractors (MACs). G0398 Home sleep study with type II portable monitor, unattended; minimum of 7 channels: EEG, EOG, EMG, ECG/heart rate, airflow, respiratory effort and oxygen saturation. G0399 Home sleep study with type III portable monitor, unattended; minimum of 4 channels: 2 respiratory movement/airflow, 1 ECG/heart rate and 1 oxygen saturation. In 2009, CMS issued a National Coverage Determination (NCD) which called out the WatchPAT as a covered test. Today, most CMS MACs request the use of G codes to report HSATs and request the use of G0400 to report WatchPAT. In 2011, the AMA added the CPT codes 95800 and 95801 to describe HSAT using peripheral arterial tone (ie WatchPAT). Note that WatchPAT records sleep time so CPT 95800, not 95801 should be used to report HSAT using WatchPAT. Most commercial payers request the use of 95800 to report WatchPAT. 95800 Sleep study, unattended, simultaneous recording; heart rate, oxygen saturation, respiratory analysis (eg. by airflow or peripheral arterial tone), and sleep time. 95801 Sleep study, unattended, simultaneous recording; heart rate, oxygen saturation, respiratory analysis (eg. by airflow or peripheral arterial tone). The bottom line is that there are multiple codes that can be used to report HSAT. Typically, CMS requests that WatchPAT be reported with G0400 and commercial payers request 95800. Since HSAT may reported by more than one code, it is best to refer to the payer’s medical policy to ensure you are reporting the correct code. In upcoming newsletter editions, we will explore additional topics including when to bill the global, technical and professional components of the code, credentialing and accreditation issues. 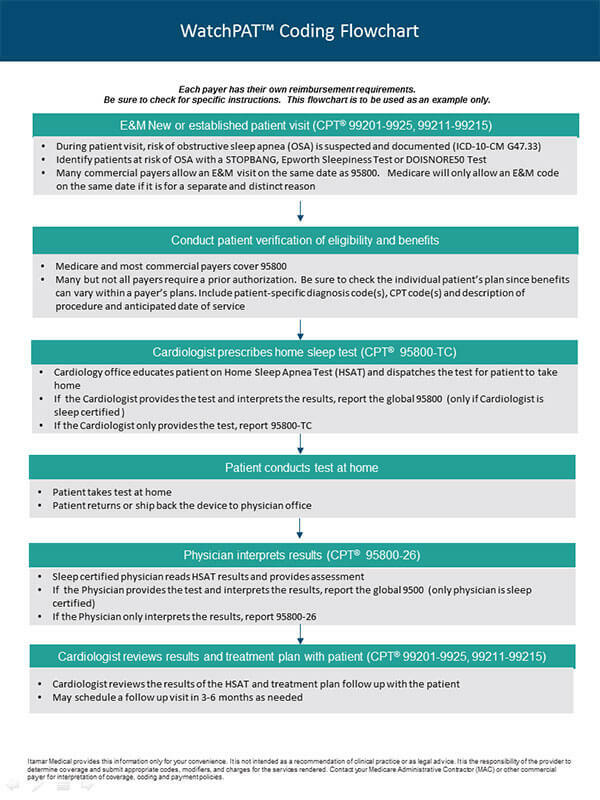 Kapur et al., Clinical Practice Guideline for Diagnostic Testing for Adult Obstructive Sleep Apnea: An American Academy of Sleep Medicine Clinical Practice Guideline, 13 J. Clin. Sleep Med. 479 (Mar. 15, 2017). Clinical Guidelines for the Use of Unattended Portable Monitors in the Diagnosis of Obstructive Sleep Apnea in Adult Patients. JCSM Journal of Clinical Sleep Medicine, Vol. 3, No. 7, 2007.